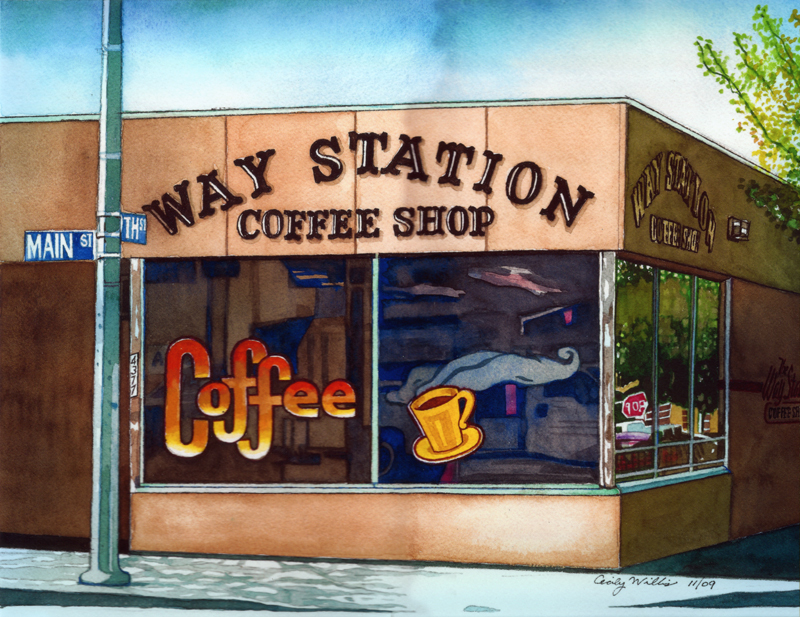 Way Station Coffee Shop in Newhall, corner Main Street & Ninth. Watercolor by Cecily Willis. 8x10 inches. I grew up in the Fair-fax/Hollywood area. Many of my paintings are about Canter's Bakery and other favorite westside locations. I want to paint them before they're all gone! A lot of my paintings are about a desire to get to "over there" — anywhere but "here." I got my Painting MFA at Otis in 1968 — a very exciting time to be in art school. It was the great era of shaped canvasses, hard-edge painting, and performance, conceptual, and installation art. However, I went through school just wanting to paint and draw realistically. I was teased, of course. A friendly insult (they thought!) was being called "Norman Rockwell." I was always asked when I was finally going to "break free" and "really express myself" through abstract art. The funny thing is, after over 40 years I still find realism to be the best way in which I can really express myself. I have been a professional artist for over 40 years in the fields of textile design, fashion illustration, and newspaper and corporate graphic design. I am now retired, living in Newhall, California and devoting all of my time to painting. I am very grateful for my varied commercial art experiences, especially since it gave me the discipline to use the same kind of commitment, devotion and integrity in my own personal work that I used to give to my commercial art clients. I love watercolor — it's like a partnership with a Higher Power. I take care of the layout, the details and the drawing, and H.P. handles the washes, the drips and the drabs, and the running colors. I love the "mistakes." I love the great adventure of visualizing what you would like a painting to be, and then have it turn out entirely different from what you imagined. That is the great fun of painting for me. Degas said that "Art is not what you see, but what you make others see." I love when people relate to my art — when they see the same things that I see or something entirely different. I love that I am a citizen of this world, that I am not "terminally unique." I believe it was Einstein who said that the great myth was that we are all separate people. I love when people can find something that touches them in my work. LW2698: 19200 dpi jpeg from original artwork.